We are incredibly fortunate to offer an exclusive tour of the Art Deco landmark, directed by Nick Cates of GBBN, the project architect of the Terminal's restoration. Nick's resume also includes such high-profile projects as the new Statue of Liberty Museum and redevelopment of the Lincoln Center for the Performing Arts. This tour is FREE, but attendance is limited to 20, so you MUST RESERVE YOUR TICKET on Eventbrite. Family and friends of the SEGD Cincinnati Chapter are welcome to attend; please reserve a ticket for each attendee. 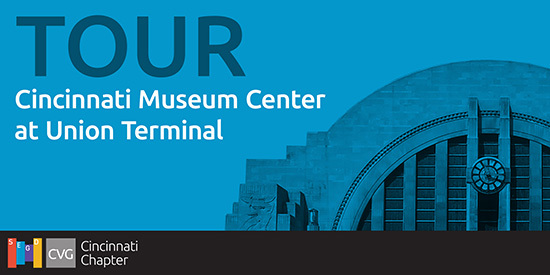 We will meet inside the main entrance of Union Terminal at 4:30 (parking on-site is $6). Afterward, we'll head to Harvest Pizzeria in Over-the-Rhine for drinks and dinner, and a chance to catch up!